This rice has a pleasant aroma. Can be packed for lunch. Pressure cook rice with 2 cups of water. Each grain should be separate. Heat oil in a kadai, add mustard, when it splutters add the bengal gram dal, urad dal, red chillies and add cashews after a while. Fry till golden. Add green chillies and curry leaves, fry for a moment and put off the flame. Squeeze lemon and take its juice. 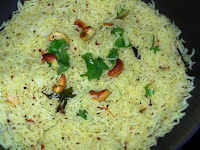 *Take rice in a shallow bowl, add 1 teaspoon ghee, salt, asafoetida, turmeric powder and pour the lemon juice. Add the seasoning from the kadai. Mix lightly when rice is slightly cool with a **thuduppu. Ginger cut it into fine pieces can be added with the seasoning. Will help in digestion. *Adding ghee helps in separating the rice grains. **A flat laddle used to turn dosas.